California mother and daughter-in-law team celebrate the launch of their newest natural beauty product, Enchant by Esteem, an all natural plant-based wrinkle cream and anti-aging serum that gets real results. Enchant by Esteem combines 26 certified organic and scientifically-backed organic botanical extracts such as Vitamin C, hyaluronic acid, aloe leaf, green tea extract, olive fruit extract, and ginkgo biloba to nourish the skin from the outside in. Mother and Daughter-in-Law duo Sandi Jones and Kayla Al-Shamma-Jones are proud to announce the launch of their newest organic wrinkle cream, Enchant by Esteem. How does it work? 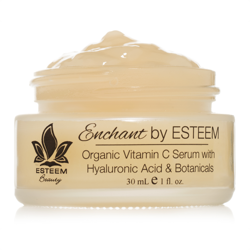 Unlike other anti-aging treatments, which involve chemically peeling the outer layers of skin or toxic injections, Enchant by Esteem combines 26 certified organic and scientifically-backed organic botanical extracts such as Vitamin C, hyaluronic acid, aloe leaf, green tea extract, olive fruit extract, and ginkgo biloba to nourish the skin from the outside in. The result is a visible reduction in fine lines, wrinkles, age spots, and other signs of aging in as little as two weeks. And unlike other “organic” natural beauty products, which are usually 70% organic or less, Enchant is 98% organic. It is also free of parabens, sulfates, sodium laurel sulfates/sulfites, petrochemicals, and artificial colors, making it one of the purest natural beauty products on the market. Even the most sensitive of skin types can use Enchant by Esteem without fear of breakouts, rashes, or other embarrassing side effects. Even better, Enchant is certified vegan and cruelty free. “Loving this serum--can see the difference in my face after only a few days. Have allergies and excema needing careful, organic maintainance…At age 70, Yes, it makes a difference.” –Marj B. Mother and daughter-in-law duo Sandi and Kayla are thrilled with all of the positive reviews. Enchant by Esteem is now available for sale through their website, http://www.esteembeauty.com, and through Amazon.com.